If Ireland are to claim a third Grand Slam this afternoon then they will have to brave the elements to triumph at Twickenham. 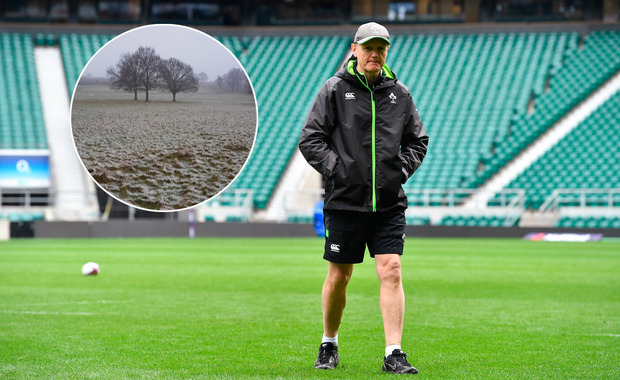 It is bitterly cold in London today, with snow currently falling at Twickenham and although it is not sticking, the conditions are sure to be difficult for both teams. The Twickenham ground staff are taking precautions in case snow does fall on the pitch, painting the lines blues so they will be more visible. The forecast for during the game is -1C with snow showers. Ireland have won just two Grand Slams, in 1948 and 2009, which makes today's game a potentially historic occasion. If they do prevail, they can lay claim to taking one of the biggest scalps in northern hemisphere rugby, with England not tasting defeat at Twickenham in the Six Nations since 2012.